Voor iedereen die op dit moment zijn bruiloft aan het plannen is voor volgend jaar: deze blog is één en al inspiratie. Vooral de tafelsetting is om bij weg te dromen en heb zelden de locatie (Kleine Melm in Soest) zo mooi gezien! De Australische Kavita zag het helemaal zitten om voor haar liefde in Nederland te komen wonen en had genoeg ideeën om deze dag met haar Thomas tot een groot succes te maken. Droomplaatje! Ben je nieuwsgierig geworden naar hun verhaal? Kavita heeft er van alles over geschreven. Wél in het engels vanwege haar roots, maar desalniettemin niet minder inspirerend. 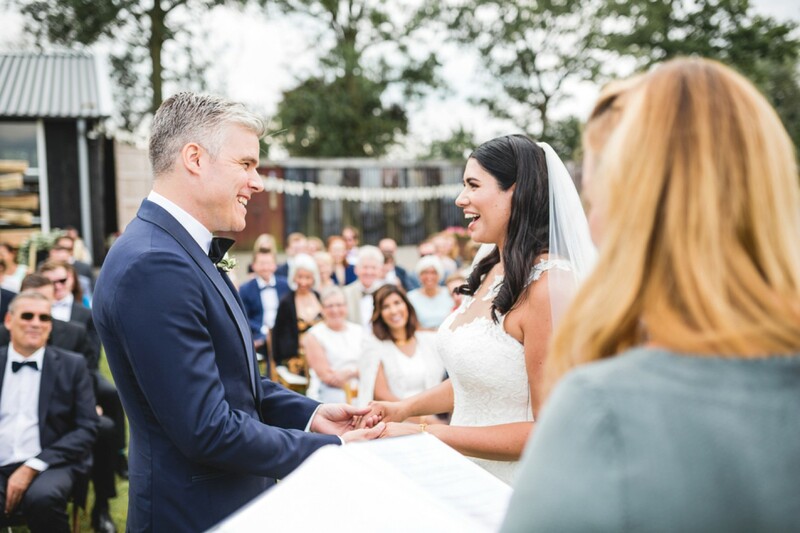 Over haar favoriete moment schrijft Kavita: Our favourite part of the day was when we were surrounded by a circle of every single wedding guest – swaying and singing our lungs out to the Australian-favourite “Horses” by Daryl Braithwaite. Even our Dutch guests, who hadn’t heard the song before, clued on and joined the impromptu moment; singing even louder than our Australian contingency! I burst into tears (again) because the love I felt at that moment from both Thomas and our friends and family was beyond anything else I have experienced. Grote dank aan Nienke voor de foto’s en proficiat aan Thomas en Kavita! Thomas and I met on a snowy December 10th, 2010 in Utrecht at a mutual friends’ birthday party. I was a somewhat rambunctious Australian enjoying a European vacation without a care in the world – certainly not expecting to meet the love of my life. Thomas was settling into full time work and hadn’t been in the mood for a party that night. There was an instant attraction between us – we became inseparable that night and for the following four days. As with all holiday romances, we became physically separated but both knew that this had been more than a holiday fling. 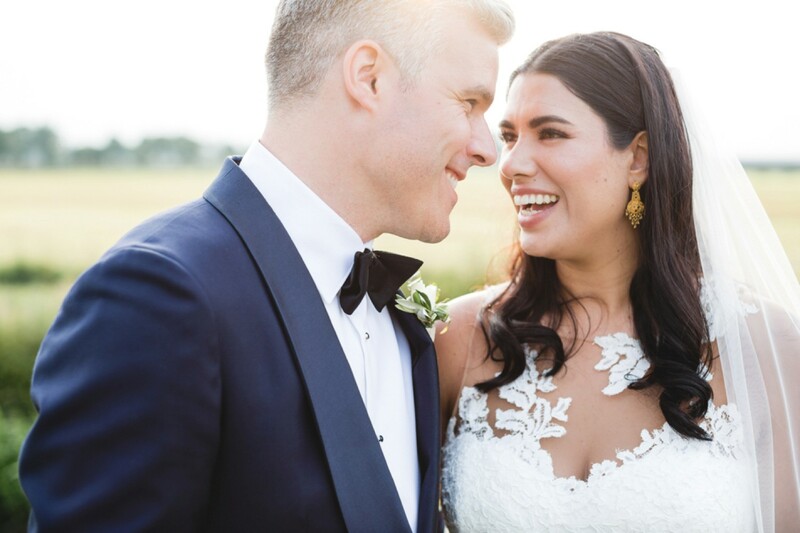 With that instant romantic spark and a lot of commitment, we embarked on a journey that brought us around the world a couple times – eventually to settle back down in Utrecht. We had discussed wanting to get married for a while and I wasn’t quite sure on the type of engagement ring I loved so Thomas knew better than to just take a guess. On the recommendation of friends, we went to Lyppens in Amsterdam who could re-set a gorgeous princess-cut diamond on a simple white gold band. After that first appointment, I left the rest up to Thomas. A few months later, Valentine’s Day rolled around and Thomas planned an afternoon for us. He toured me around all our most memorable spots in Utrecht giving me a red rose at each location. Wondering if this was going to be one of his practical jokes, I rode off the idea of a proposal 3 hours into our tour. To finish the romantic afternoon, he booked us on a tour up the Dom tower. A point of laughter for me, because since the day we met I had teased him about never having been to the top. After a very nervous climb to the top (for Tom), he asked a stranger to take a photo of us and at that very moment – he dropped to his knee! Of course, I was overcome with shock, then tears, then a big grin and the words ‘yes’! We both wanted to make a deep commitment to each other in front of our closest friends and family. It means we always have each other backs, will laugh and cry together and most of all; support each other through thick and thin. I can’t imagine going through life with anyone else and we look forward to growing and learning with each other year after year. 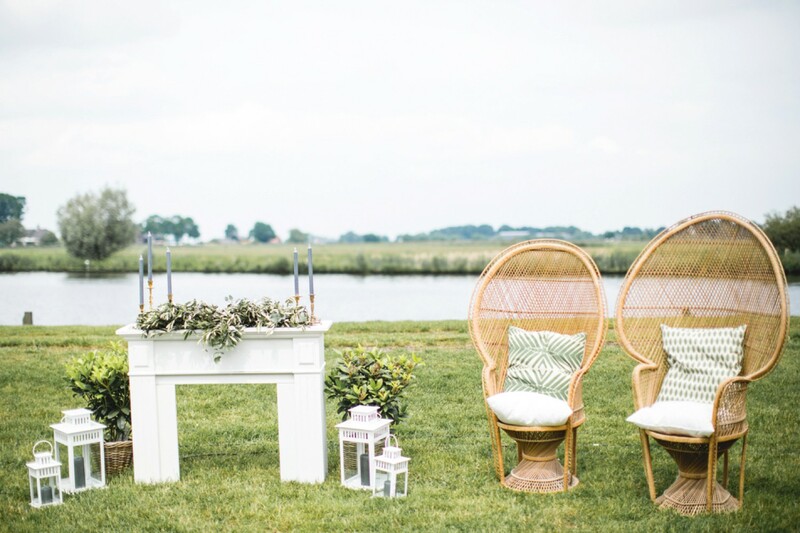 We selected our venue, an old family-owned rowing shed because of its idyllic (and truly Dutch) scenery and because it was the perfect blank canvas for us to personalise. From the draping and venue design details to the wine selection – every element and decision could reflect us as a couple. We had toured several places in the Utrecht region but found most to be too rigid and formal in their offerings. As we had guests coming from overseas it was also important that the venue could host us for the whole afternoon and night without guests having to move locations. As a bonus, local friends from Baarn were able to get to and from our wedding on a boat on the Eem! We absolutely made the right decision and it will always have a special place in our heart. 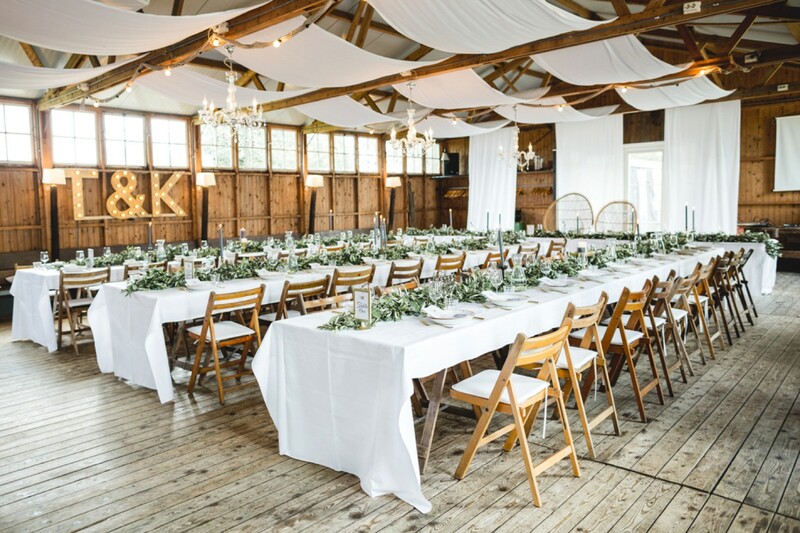 When planning, I found myself continuously falling into the rustic elegant theme. The Kleine Melm was such a casual, setting on its own but I wanted to dress it up to reflect the occasion and our love for just a little touch of luxury. 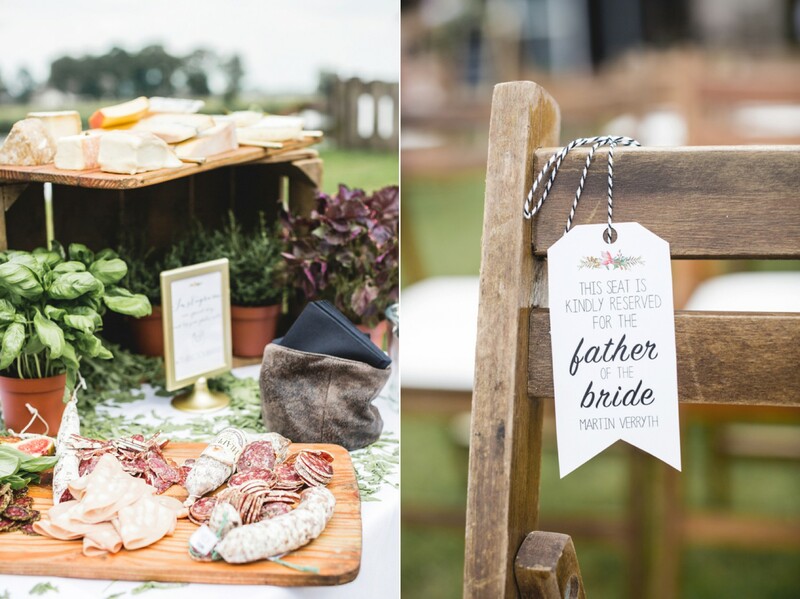 I spent many hours on Pinterest and wedding blogs from across the world and the rustic elegant trend was particularly popular at home in Australia which helped me really picture the day. 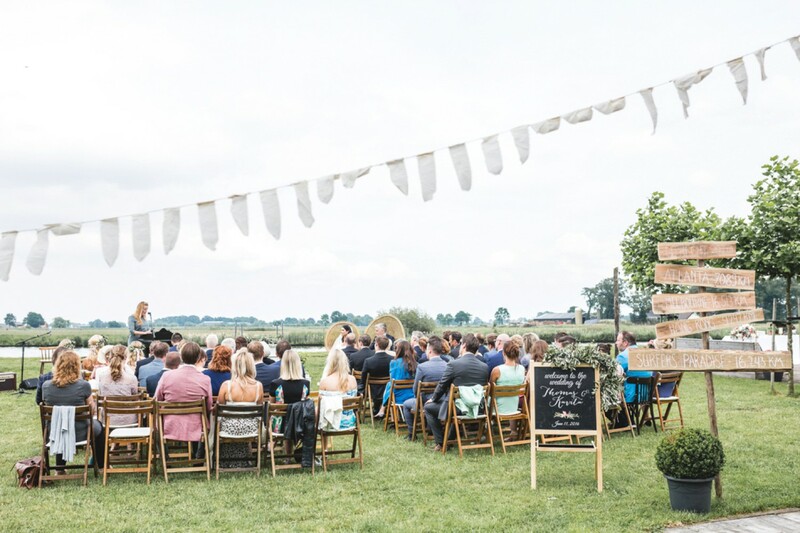 Finding vendors who could work with the theme was the next challenge but thankfully we found great teams like Te Leuk Trouwen who were also interested in the same aesthetic and styling. 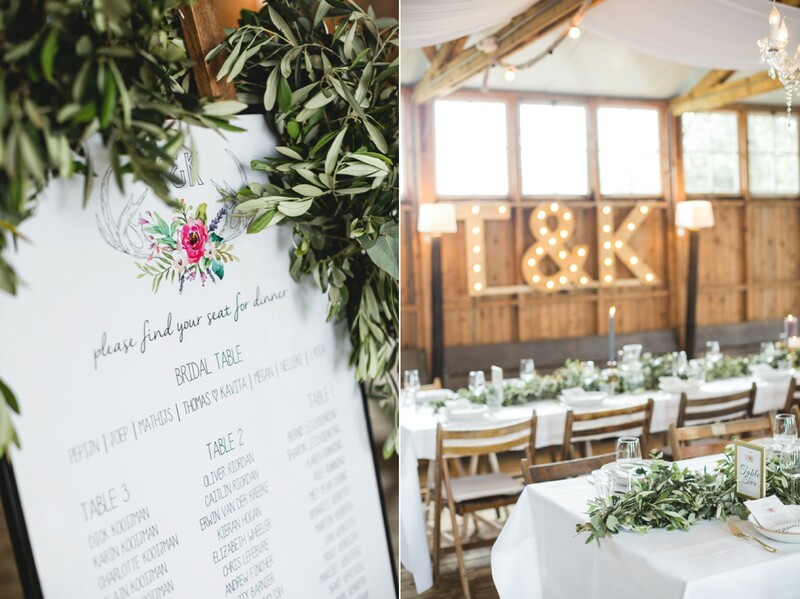 The draping of the shed, table settings and ceremony backdrop were my most loved ideas of the day because we had no way of ‘testing’ them beforehand – yet they turned out perfectly! Guitarist & Singer, Zoe from Manoah performed during our ceremony. 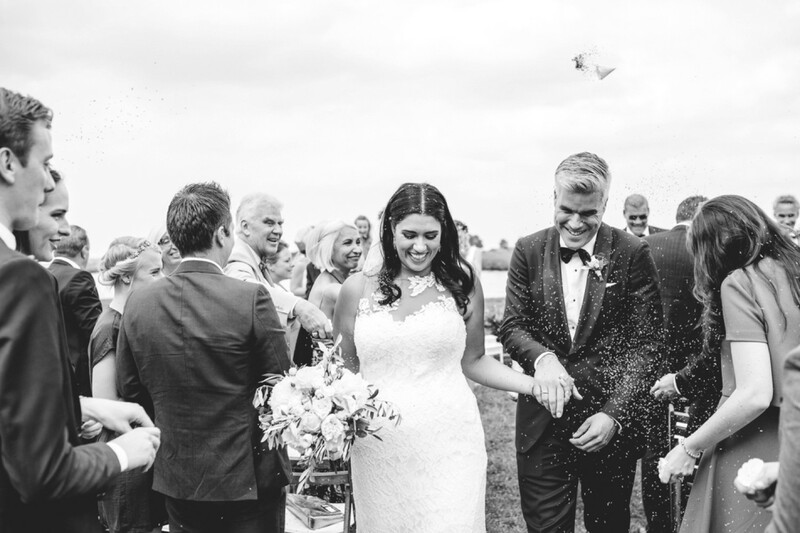 Our favourite part of the day was when we were surrounded by a circle of every single wedding guest – swaying and singing our lungs out to the Australian-favourite “Horses” by Daryl Braithwaite. Even our Dutch guests, who hadn’t heard the song before, clued on and joined the impromptu moment; singing even louder than our Australian contingency! I burst into tears (again) because the love I felt at that moment from both Thomas and our friends and family was beyond anything else I have experienced. We left for our honeymoon two days after the wedding for some much-needed rest and relaxation. The first stop was Mexico where we stayed at Paradisus La Perla in Playa del Carmen. We dream of going back there every single day! Following some sun and sea we went to Toronto and Niagara-on-the-Lake for some sightseeing and the gorgeous wedding of one of my bridesmaids. It was a wonderful wedding season! Stay true to yourselves as a couple but don’t forget to think about your guests’ experience. 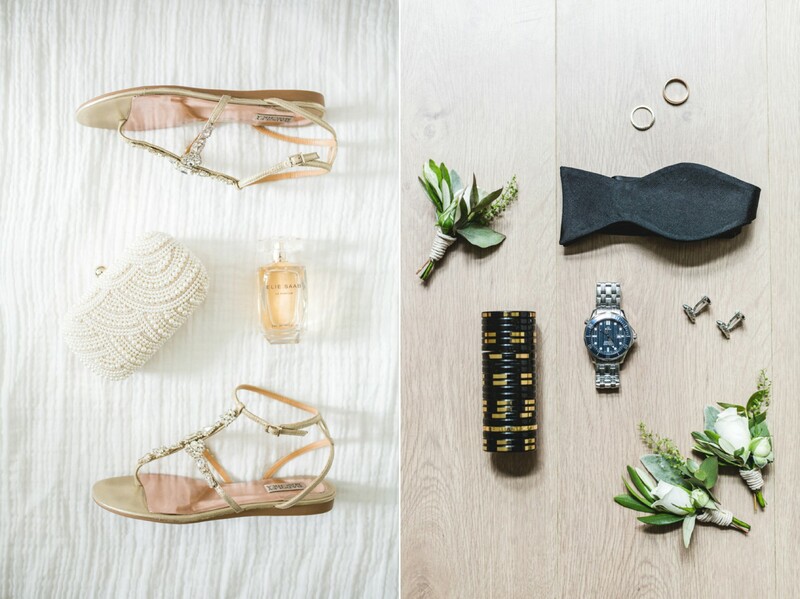 So many weddings are made-for-magazines now-a-days that the experience of the bride and groom as well as the guests are forgotten for the sake of a pretty picture. For us, seeing that our closest friends and family having such a wonderful time truly made us happy! These are the memories that can’t always be captured on film – but it certainly does help that we do have such lovely photos and videos to remember the rest.